Description: This sea anemone has an adherent base and a fairly wide column not divided into regions. The column is smooth, without warts or other features. 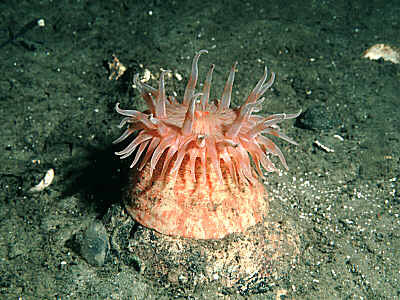 Tentacles are moderate in length, arranged differently from other anemones; Six in the first cycle, 10-12 in the second, this is usually easily observed. Height and diameter of base to about 70mm. Colour variable, column may be white, red, orange, yellowish or brown often blotched with red. Disc and tentacles sometimes plain orange, other varieties probably occur. May release hold on substrate and jump around if threatened by a potential predator, e.g. some starfish and sea-slugs. Habitat: Typically found attached to shells, or stones rather than bedrock. Exclusively sublittoral, from 10m depth to deep water. Distribution: All coasts of Britain except extreme south; widespread throughout cold temperate and sub-artic regions of the northern hemisphere. Probably not uncommon but few recent reports in Britain. Similar Species: Superficially similar to specimens of Urticina eques but latter has tentacles arranged 10+10 etc., small warts on column, and prominent parapet/fosse region. Urticina eques is usually much larger. Column not divided into regions and without warts. Picton, B.E. & Morrow, C.C. (2016). Stomphia coccinea (O F Müller, 1776). [In] Encyclopedia of Marine Life of Britain and Ireland.